All orders outside the UK must contact us first for an accurate shipping rate as shipping varies with this being an over sized item. The shipping on the system is just an estimate for this product. Refrigerators and freezers for the demanding camping and off-roading enthusiast. Innovative features and the best cooling performance at extreme outside temperatures. One or two cooling and freezing compartments that go to -22° Celsius and have their own flip covers. For 12 and 24 Volt DC as well as 100 to 240 Volt AC. Comes with a five year warranty on the compressor. 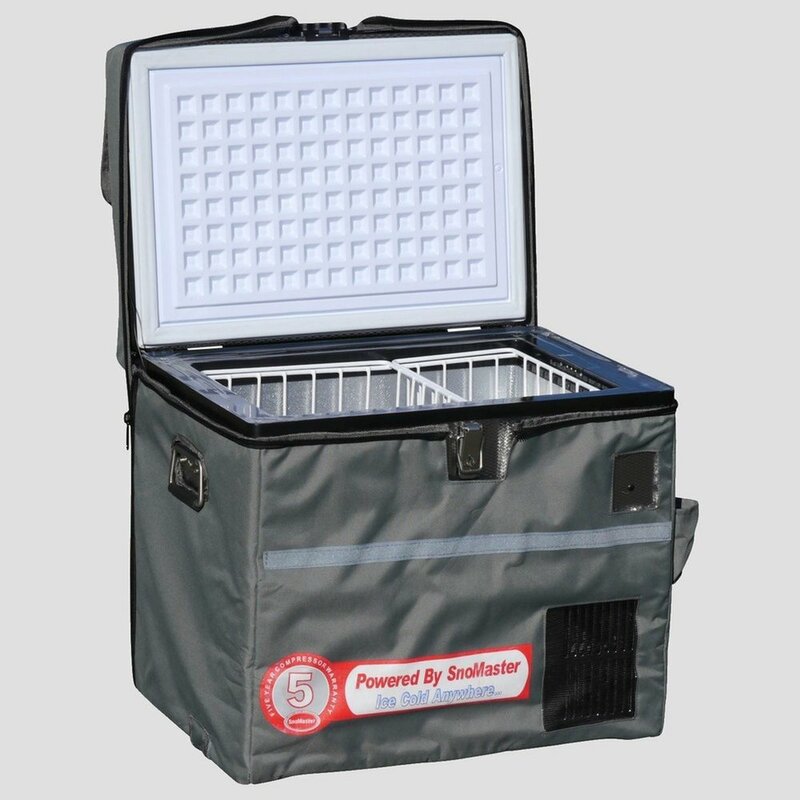 Constructed for tough use in Africa, the fridges and freezers from the Classic and Expedition Series from SnoMaster are unique to the market, in many respects. They have been developed with first priority for their customers, and no compromises have been made with respect to limitations or practicality. The coolers are regularly redeveloped in great detail. That is why no other cooler offers as many useful features. The outer shell, interior and all fittings are made of stainless steel or aluminium which gives it a longer lifespan. Each cooling compartment has its own lid. This makes handling easier and reduces power consumption since unnecessary cold loss is then avoided. Every journey is different, so the temperature can be adjusted separately for each compartment, between 10° and -22°C. With SnoMaster there is no specification for which is the cooling and freezer compartment and there is no fixed temperature difference between the two compartments. If desired, both compartments can be used as fridges; one for drinks and one for food, or simultaneously both can be used as freezers. They are as simple as they are brilliant: for beer lovers, all SnoMaster coolers offer a built-in bottle opener with a safety cover. Removable baskets facilitate the organization and access to your goods, and in the dark integrated LED lighting helps you find them. 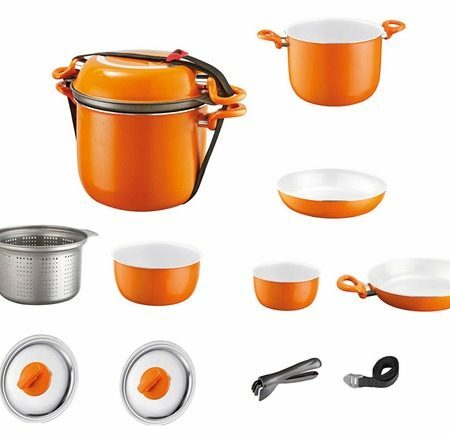 The high-quality stainless steel inner compartments are easy to clean thanks to the built-in drain. Also, no compromises have to be made when choosing your power supply. 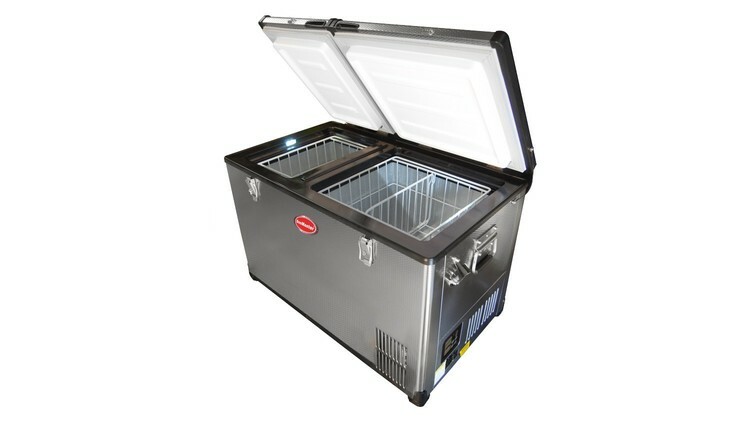 All coolers can be operated with 12 or 24 Volt Direct Current (DC) and with 100 to 240 Volt Alternating Current (AC). No external power supply is required. A built-in battery monitor prevents the cooler from draining the battery supply in your car. This would be both damaging to your car battery, and inconvenient. All settings are displayed on an intuitive panel with large and bright LED interface with direct temperature selection in Celsius. SnoMaster never compromises with the compressor and has developed its own high-performance compressor designed specifically for off-road applications. This also contributes to the energy efficiency of the coolers, as does the 70 mm thick insulating shell. The strength of the insulation is the only distinguishing feature between Classic Series (which is 60 mm thick) and Expedition Series (at 70 mm thick). Another special feature is the models of the Low Profile/Tongkua Series. These fridges have been specially designed for operation on a pickup truck, to be mounted under the loader cover. 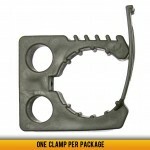 They are therefore not only shorter, but are specially designed for operation in a very warm environment. The heat dissipation was also improved with the addition of a special evaporator and fans. The insulation is 65 mm thick. No optional extras necessary. The removable baskets, protective cover (except for the Tongkua Series), as well as all 230 Volt equipment, are always included. SnoMaster guarantees a five year warranty on the compressor. Specially designed for operation on a pickup truck. The honeycomb-shaped design on the outer shell of the stainless steel cooler not only gives SnoMaster coolers a high-quality appearance, but also makes them easy to maintain and provides additional stability. The surface is significantly more scratch-resistant than a plastic or a smooth metal surface. In contrast to plastic, which becomes brittle and often fades in colour, we do not have these problems with the SnoMaster stainless steel shell. This sturdy exterior makes it easier to inject the insulating material of polyurethane foam than with a plastic or smooth metal surface. This results in an even better insulation of the interior. The shells are 60 mm for the Classic Series and 70 mm for the Expedition Series, so they have excellent cold storage capacities at higher outside temperatures. This is also true if the box is disconnected from the power supply or has reduced power consumption while in operation. All fasteners, hinges and handles are made of stainless steel for a longer lifespan and as protection against corrosion. The locks of the hinged lid can be secured with a padlock (not included), if necessary. All fittings are screwed on and can be easily replaced in the unlikely event of damage. The hinge covers are adjustable. 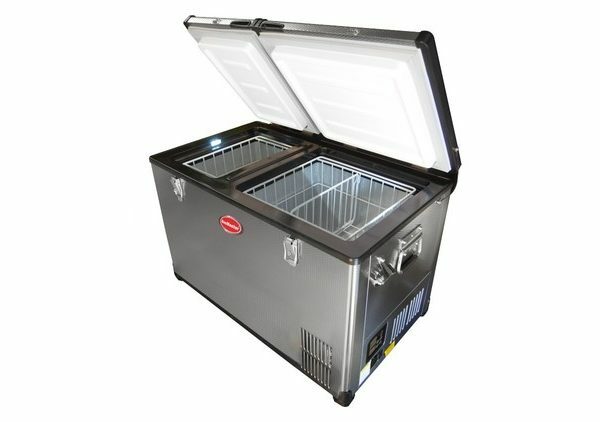 Except for the inside of the lids, the interior of the coolers are made of easy-care aluminum. For hygienic and practical reasons, there are no cooling coils or plates. This makes cleaning much easier. No dirt can hide in corners or behind metal sheets and nothing can rust. When used in vehicles, the coolers are often exposed to strong vibrations. Plastic surfaces can then be scratched by the food inside, or they can be permanently discoloured by packaging and often look very faded and weathered over time. With the easy-care SnoMaster interior, this does not happen. The one invaluable advantage of SnoMaster coolers with two cooling compartments are the separate flip covers for each compartment. Every time you open the main door, it inevitably causes the temperature in the cooler to rise slightly as cold air is lost, and then the fridge must be cooled down again. With smaller compartments, the temperature rises again much faster. Coolers from other manufacturers with only one cover leave you a disadvantage. Furthermore, if one compartment is used as a freezer, the cold loss is even more significant. Many manufacturers are able to provide an additional plastic cover for the smaller compartment. This makes the handling more inconvenient, as access to the freezer compartment must always open both compartments. It is, therefore, much easier and much more energy efficient to have separate lid covers for each compartment. All SnoMaster coolers come with three plastic-covered, metal baskets. Two stackable baskets on the left side, and on the right one basket which sit on the compressor. For coolers with two cooling compartments, two baskets stacked one on the other in the left, smaller compartment. In the right staircase-shaped compartment has a large basket with a removable, separate basket. Each cooling compartment has a power-saving LED light that automatically turns on when the lid is opened. Each compartment can be set anywhere from 10° to -22°C according to your wishes. As required, a compartment can be used as a refrigerator or as a freezer. For coolers with two compartments, you can choose between using both as cooling compartments, one of each or both as freezers. Most other coolers on the market have a fixed temperature and often the temperatures can not be individually reset. This could result in low temperatures in parts of the refrigerator or freezing of the drinks and damage to the refrigerated items. All necessary cables are included in the delivery. No external power supply is required for 230 Volt operation. Plugging the fridge into the cigarette lighter supplies a fixed access to power in the car. When operating with a cigarette lighter or a car socket, this should be designed for at least 120 Watt (10 Amps at 12 Volts, 5 Amps at 24 Volt). If you use your own connection cables, these should have a dimension of 2×2 mm². To prevent draining your battery supply, all fridges are equipped with a battery monitor. This can be adjusted via the control panel in three steps between 10.0, 10.7 or 11.8 Volt or 22.2, 23.5 or 25.0 Volt . When the voltage supply is too low, the fridge turns itself off. This prevents draining the car battery which can cause damage both to the car and fridge. Each fridge comes with a protective cover. This not only protects the surface of the fridge from contamination or damage, but also offers added insulation. If you are traveling in hot temperatures or dusty environments you will appreciate this. Particularly, if the fridge is not installed in an air-conditioned vehicle, but instead in a pick-up bed, a camping trailer or a caravan. The protective cover is closed with a zipper and has a storage bag and comes with a bottle opener. The SMDZ-LP65 model is a special feature. This cooler has been specially developed for operation on a pickup platform under a loader-space cover. The fridge is therefore not only smaller, but is specially designed for operation in a very warm environment. The heat dissipation was improved with a special evaporator and fans. To ensure that it does not warm up, this fridge comes without a protective cover. The insulation is 65 mm thick. Usually one should leave the performance control to the machine, but if you are sleeping right next to the fridge and want to reduce running noise, you can select a lower setting. That being said, the fridge is usually quite quiet with a sound pressure level of 47.3 dB. There is no difference in the automatic power control whether the fridge is operated on direct or alternating current. That is to say, the compressor also provides the full cooling power even when operating at 12 Volt in the vehicle. The SnoMaster compressor has a 20% higher performance rate than Danfoss’s BD35F, which is often installed and advertised on other brands and is slightly newer than the larger BD50F. A more powerful compressor usually allows a higher cooling efficiency on a day-to-day basis, resulting in lower power usage. What is interesting to note, is that SnoMaster also produces technically simpler fridges for warehouses and installs the Danfoss compressor in them. The SnoMaster’s own compressor is only used for the high-quality fridges sold under its own brand name. SnoMaster coolers are equipped with an integrated diagnostic system, which outputs error messages on the temperature display if there is a problem. -28 or LL: Temperature controller is defective or valve blocked in the open position. Repair is necessary.